Dr. Holló was elected Judge of the Constitutional Court by Parliament in November 1996. From November 1998 to July 2003 he was Vice-President, from August 2003 to November 2005 President of the Constitutional Court. His term of office as Judge expired on 12th November 2005, by termination of the charge period. He was re-elected Judge of the Constitutional Court by Parliament on 14th November 2005. He has been Vice-President since July 2008. 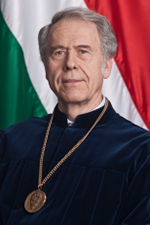 After graduating from the Faculty of Law of Eötvös Loránd University of Budapest (ELTE) in 1966, he worked as a prosecutor at the Chief Public Prosecutor’s Office from 1971 to 1979. Between 1971 and 1981 he held a seminar on Constitutional Law at the Faculty of Law of ELTE. Apart from the above activities he participated in several research projects in the field of civil rights. From 1981 as one of the founding professors, and since 1984 as a senior lecturer, he has been working at the Department of Constitutional Law of the Institute for Political Science at the Faculty of Law of Miskolc University, of which he was Head until 1993. Between 1979 and 1989 he was senior member and head of a research team at the Institute for the Organisation of Public Administration. As member of the Secretariat for the Codification of the Constitution of the Ministry of Justice, he participated in the preparatory work of the new Constitution. From 1990 until being elected Judge of the Constitutional Court, he worked as Secretary General thereof. He defended his thesis for a candidate’s degree in 1984. His interests and theoretical publications are focused on the theoretical questions of legality and constitutionality (protection of the Constitution) as well as on civil rights issues.